We posted this photograph yesterday on our Twitter feed as part of the Centre’s #ShowUsYourSoldier campaign to raise money for capital costs. Fundraising aside, I thought I would dig more deeply into Captain Brooke’s story and see what his experience on the Western Front had been. In many ways, Kingsley Capron Brooke was typical of the so-called “officer class” of the first half of the war. He was solidly middle-class and worked for the Canadian Mortgage Investment Company when he volunteered in the fall of 1915. He had previous militia service with the 12th York Rangers Active Militia; his father and grandfather had also been officers, serving with the Queen’s Own Rifles. 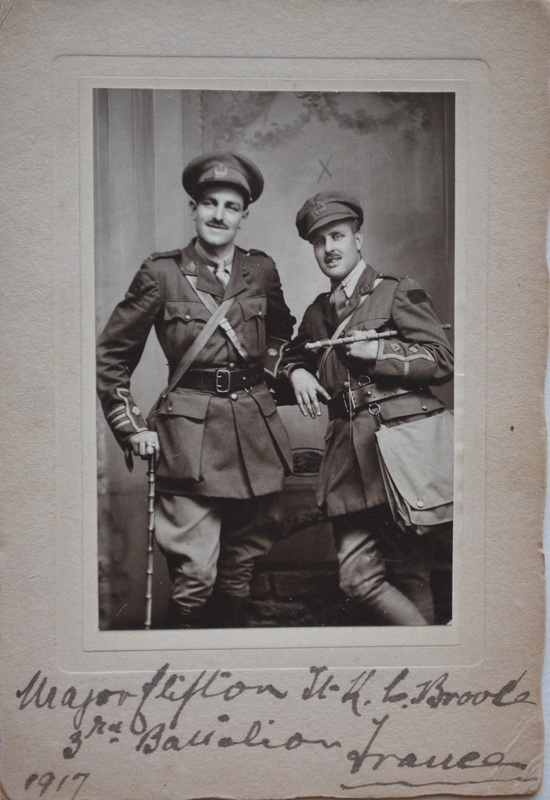 Brooke originally enlisted at the rank of lieutenant with the 81st Battalion, which was raised mostly from residents of Toronto, and embarked to England with the battalion in April 1916. The 81st Battalion would never see France as a complete unit; its men were instead funneled into existing battalions already on the front as reinforcements. The battalion itself was disbanded in July 1917. Brooke was posted to the 3rd Battalion (Toronto Regiment) in July 1916 and fought with them through the battles of the fall of 1916 and 1917. The 3rd Battalion was part of the 1st Division and at Vimy Ridge went over the top as part of the second wave attack, which aimed to capture Farbus Wood after the first wave had taken their objectives. As a lieutenant at that point, it is likely that Brooke went over the top with his men. Casualties for the 1st Division were heavy, with over 2 000 losses by the end of the day, but Brooke was not one of them. He survived Vimy unscathed and went on to advance with the Division towards Hill 70 and Lens, the big Canadian campaign of the summer and early fall. Hill 70 was General Sir Arthur Currie’s first battle as commander of the Canadian Corps and the situation presented to him was difficult. Hill 70 was a limited objective battle, meant only to take the rise held by the Germans on the outskirts of the mining city of Lens and to use it as a point to take the city itself later. The attacking forces had to advance up the hill, with enemy gun emplacements above them, and push the Germans off the crest and down the other side. This would be achieved through a 3 phase attack that ultimately stretched over several days until the entire hill was taken. Brooke’s luck would hold at Hill 70 as well; the 3rd Battalion was kept in reserve on the first day of fighting (15 August) and moved up to replace part of the 3rd Brigade only on 16 August when they entered the support trenches at that battle. The battalion was later found holding the Brigade front line in September 1917, on 20 September during a German trench raid Brooke was lightly wounded but remained on duty. Brooke was never hospitalised for his wound and was promoted to temporary captain in November 1917. He was seconded to the Canadian Cavalry Corps Reserve in the spring of 1918 and was not returned to the 3rd Battalion until September 1918 where he would have seen action as part of the Hundred Days campaign. Brooke was awarded the Military Cross in March 1919 and demobilised soon afterwards; he was, all things considered, a very lucky man. The survival rate for mid-level officers, ie lieutenants, was estimated to be on average about 6 weeks.